Welcome to "Around The World in 12 Dishes". We are taking a journey around the world, (loosely) following in Phileas Fogg's footsteps, by exploring 12 different countries and cooking 12 dishes - one for each country we visit. The world is such a wonderfully diverse and colorful place. With an upcoming family trip out of the country this summer I was excited to get us a bit out of our comfort zone and explore some more of the world with the Lil Divas. What better way to really bring it all to life for them than through food?! Not only is it an exciting and different way to learn about cultures, but cooking with children brings a host of benefits - from numeracy and science, to following directions and so much more. You just can't beat that! Adventures In Mommydom, Creative Family Fun, Glittering Muffins, Juggling with Kids, Keeping Life Creative, Kitchen Counter Chronicles, Make, Do & Friends, Mummymummymum, Rainy Day Mum, Red Ted Art, The Educators' Spin On It, The Outlaw Mom and me - Mom to 2 Posh Little Divas, have come together to help you on your food journey. We will each be cooking a dish with our children and sharing it with you. We hope to inspire you to try something yourself! So go out there, cook, blog, and then join in with us on the linky fun below! We begin our journey the same way Phileas Fogg did in London, UK. The only mandatory part is the dish, the rest is all up to you. We thought it would be fun and more concrete for the kids to learn a bit more about each country by further exploring its culture, etc.. through a book and working on an activity/craft. Cook a dish from the UK: The goal is to explore this country through FOOD (and activities if you wish). Make a typical dish (sweet or savoury) from the country with the kids, take photos and have fun! Read a book: We read Paddington Bear, who can resist the adorable bear that made his way from Darkest Peru to London's busy Paddington Station. Paddington Bear's humorous misadventures were a hit with the Lil Divas and this "preschool" version of the classic story was perfect for their age group. Online fun: www.paddingtonbear.com A site devoted to the much loved and well known Paddington bear. It has some fun printable and online activities for your child to enjoy. Share with us: Our challenge starts on March 4, 2012 and will remain open for a year. 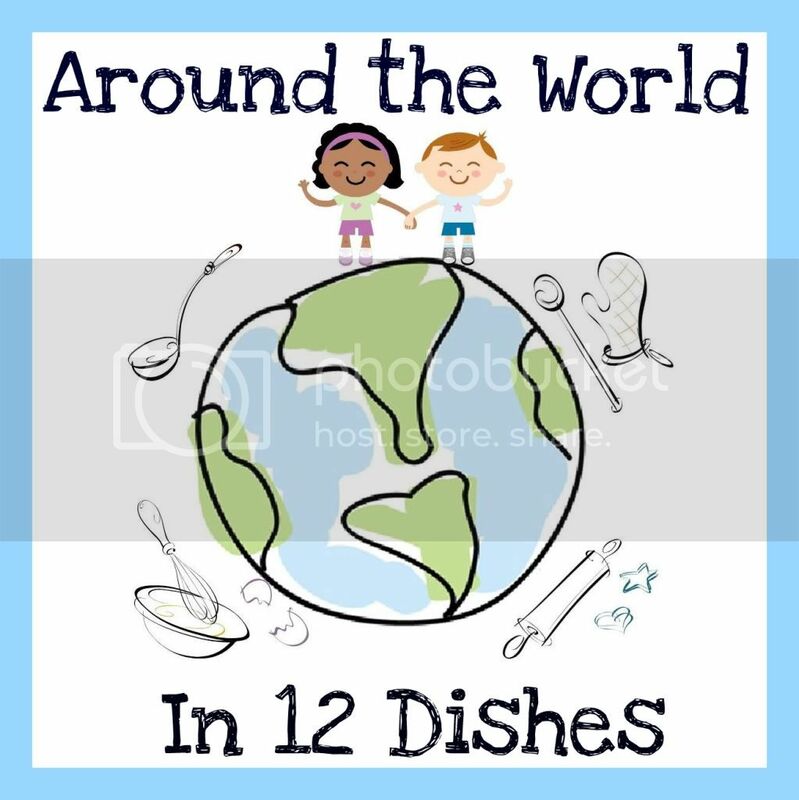 To join in on the fun attach a link to your blog to the linky party below, visit the Around the World in 12 Dishes Facebook page and post a photo along with what you did with your child(ren) or just comment in the comments section below. Are you a blogger? Let your fans know about the challenge by grabbing our cute lil’ button & sharing it on your blog. Thank you! We made Cinnamon Chip Scones & Cucumber Sandwiches. 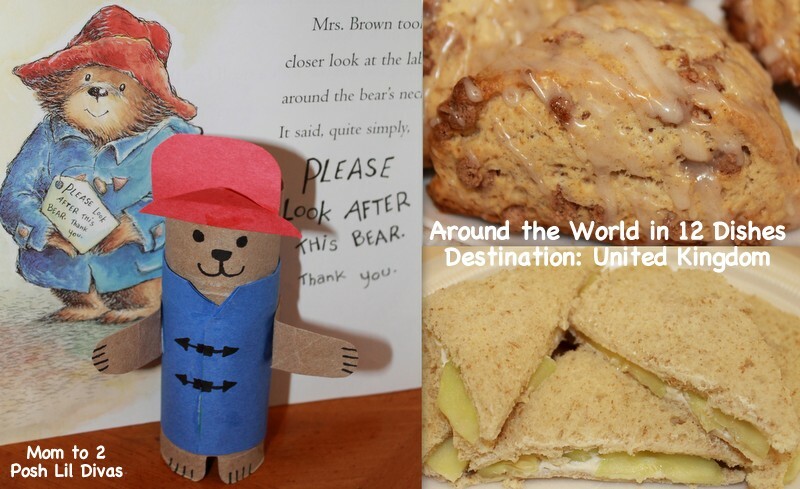 We also read Paddington Bear and made a TP Roll Paddington Bear. We are looking forward to next month's destination. Until then, I hope you will be inspired to join us! I am so excited you did this! I love the passport and placemat printables too! Since I have to wait until our huge move the end of this next month I really appreciate you keeping this open for an ENTIRE year!!! Yes, we will visiting one new country a month for the next year & encourage everyone to jump in when they can. This will be a wonderful journey for all! I am so excited to share a bit of the world with my girls. What an awesome idea...so great for homeschooling families...or for teachers as well. Love the Paddington Bear craft...you are so very creative! Years ago, my daughter's high school class did something along similar lines...the class was broken down into groups of 5 or 6 and each group visited one of the homes to enjoy an international meal. I love your little Paddingtom Bear Craft, I know what we'll be making and reading this week as we cook a few more recipes from the United Kingdom! I'm thinking we just might add him to our Toys from the UK! We're from the UK, we do a similar thing from time to time - World Food Week - which our kids love. We pick a different country each day. Would love to hear your recipe suggestions for what we could try when we do America!